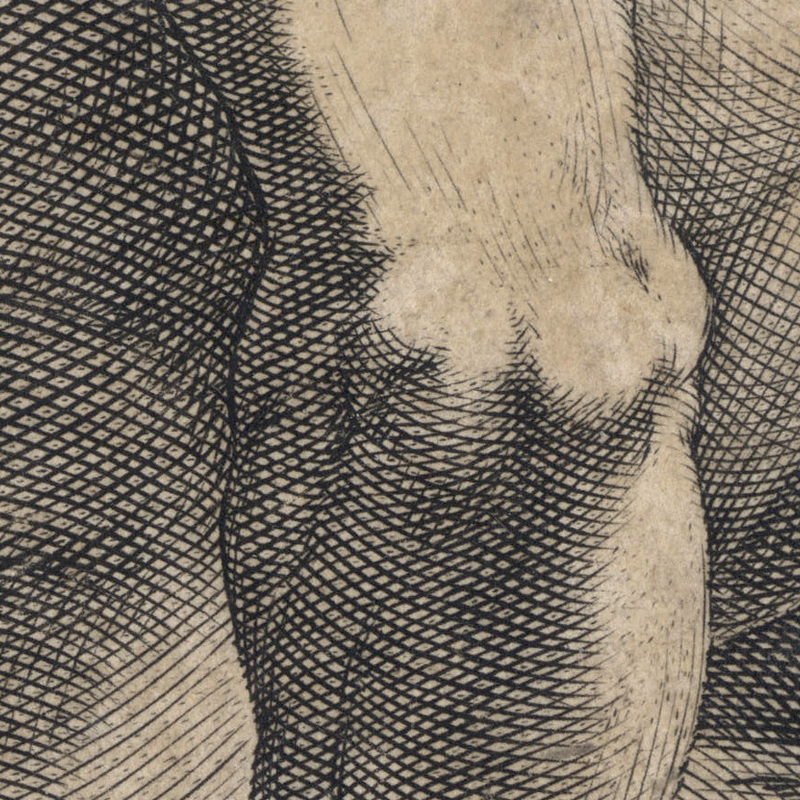 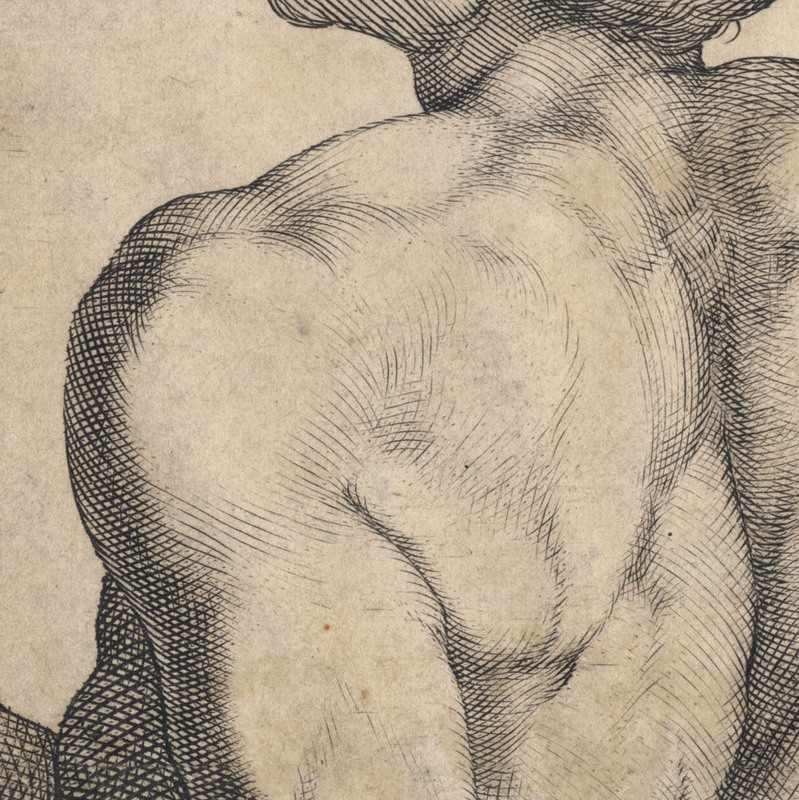 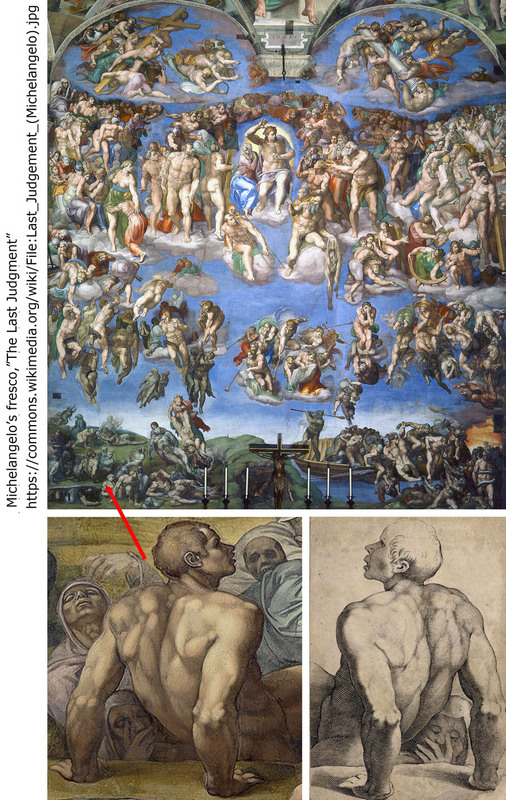 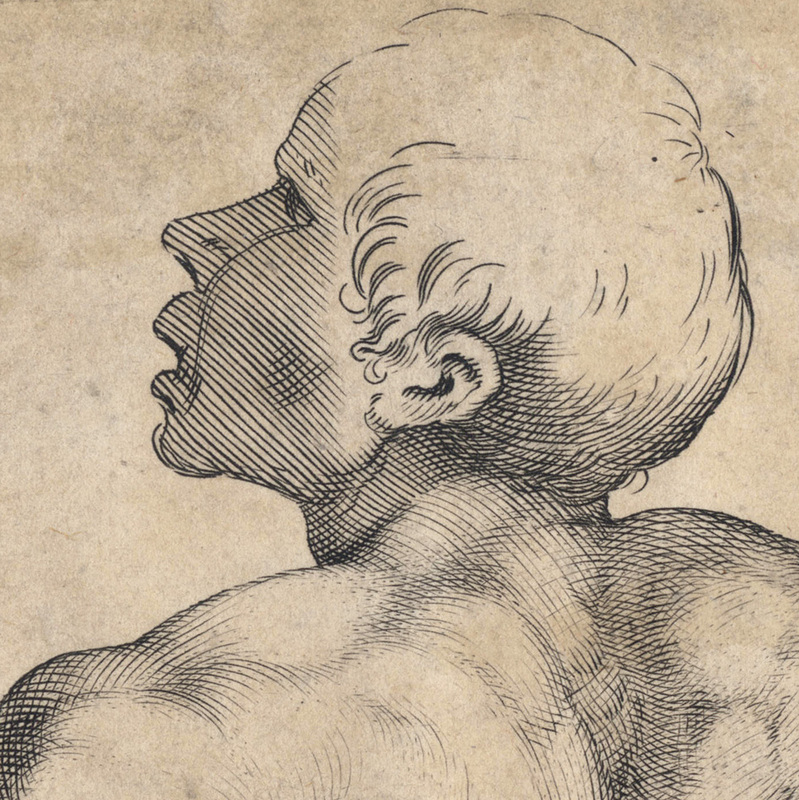 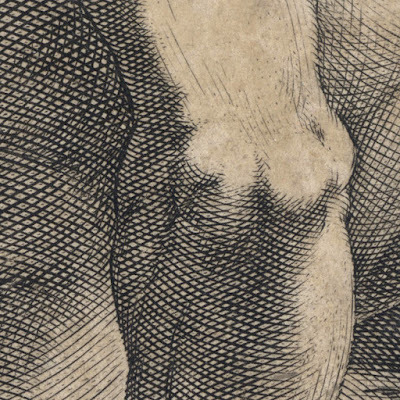 “Resurrecting Figure” (aka “Man’s Torso Seen from the Back, Leaning on His Two Arms” [TIB title]), 1597–1629, after a detail (in reverse) from Michelangelo’s (aka Michelangelo Buonarroti) (1475–1564), “Last Judgement” (Sistine Chapel, Vatican), and published by Pietro Stefanoni (c1557–1642) in Rome. 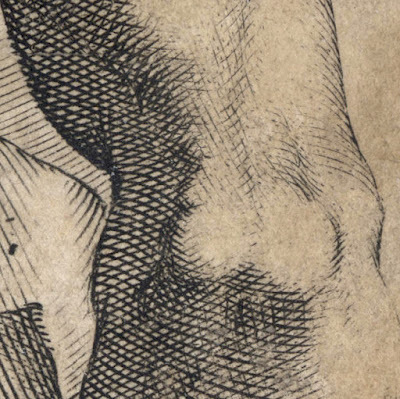 Engraving on fine laid paper trimmed on/within the plate mark and re-margined with a support sheet. 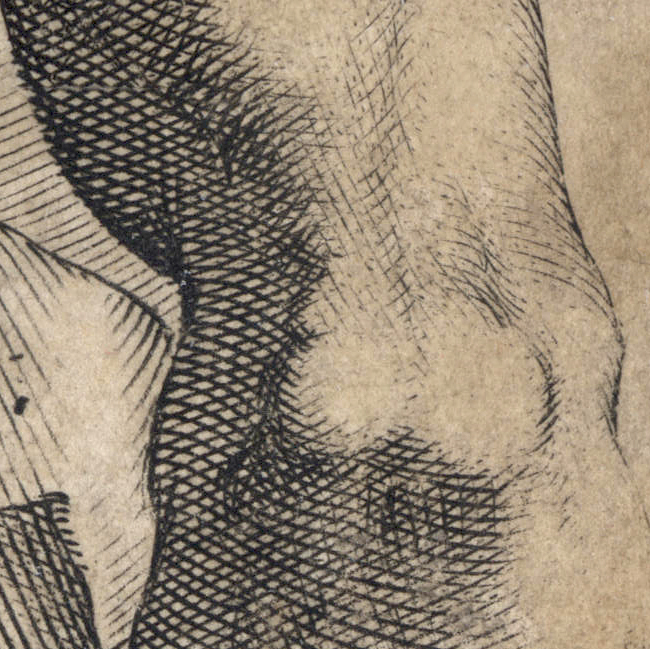 Condition: crisp impression trimmed within the platemark with the publisher’s initials removed and re-margined on a support sheet. 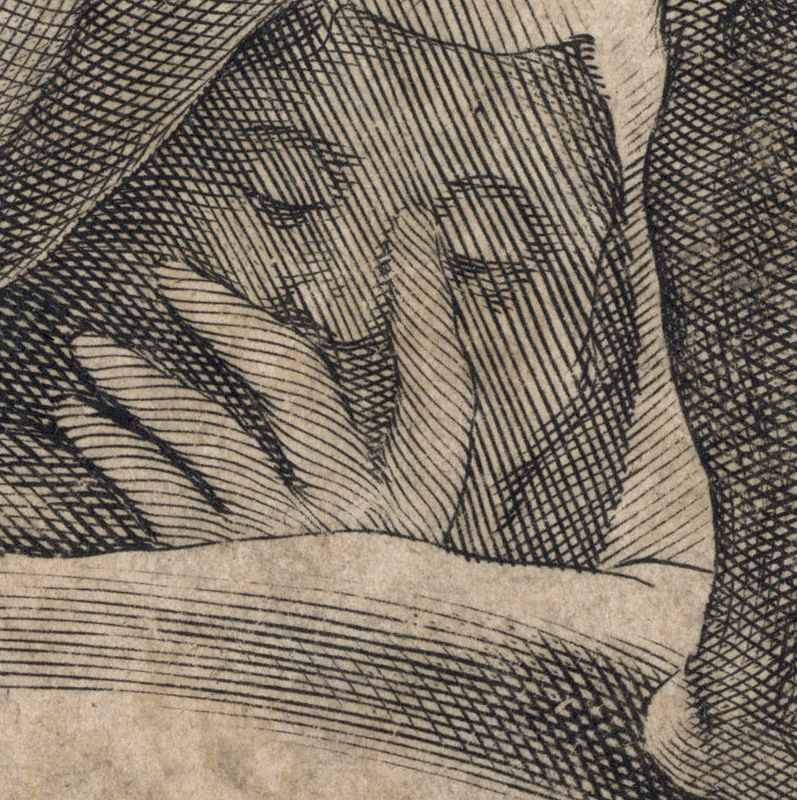 The sheet is mottled in colour and the edges of the print have been restored to make the uneven trimming of the sheet less distracting, otherwise, there are no tears, holes, folds, abrasions or foxing. 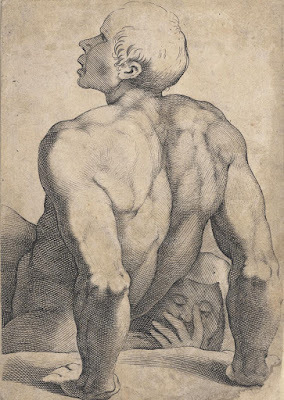 I am selling this finely executed engraving from the Renaissance era—interestingly it was executed around sixty years after Michelangelo completed his fresco from which this study is a detail—for AU$170 (currently US$138.05/EUR111.06/GBP97.53 at the time of posting this listing). 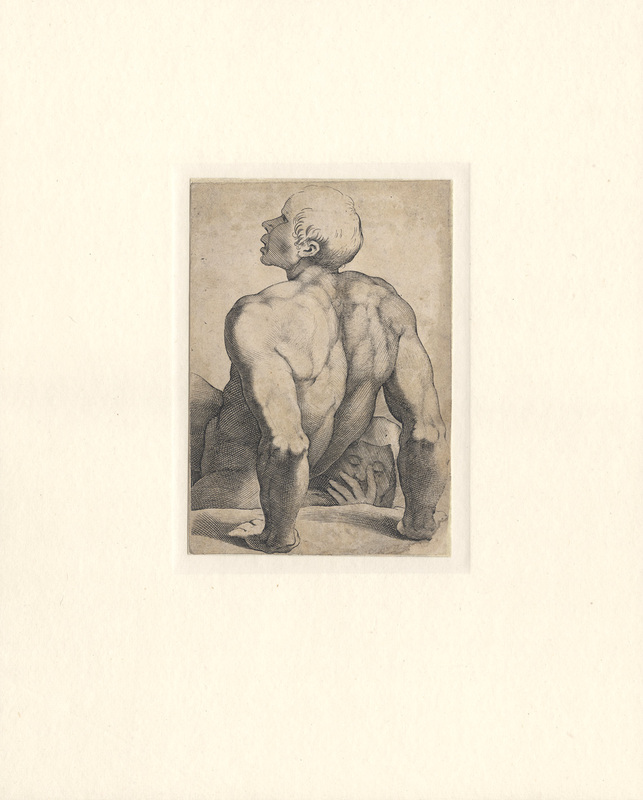 Postage for this print is extra and will be the actual/true cost of shipping. If you are interested in acquiring this early and very rare study, please contact me (oz_jim@printsandprinciples.com) and I will send you a PayPal invoice to make the payment easy. 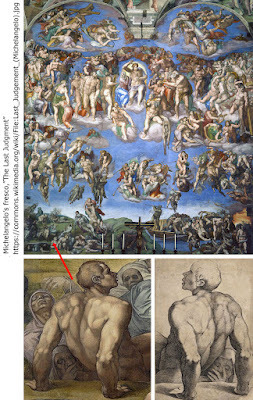 Diane DeGrazia Bohlin (1980) in the TIB catalogue raisonné lists this print as executed by Agostino Carracci after Michelangelo whereas the British Museum proposes that Carracci may have been the intermediary draughtsman with Luca Ciamberlano (aka Lucas de Urbino) (fl.1599–­1641) as the true engraver. If this were an engraving by Ciamberlano then this would help to narrow the attribution of its dates of execution from what is currently 1597 to 1629 (proposed by the British Museum) to 1597 to 1614. 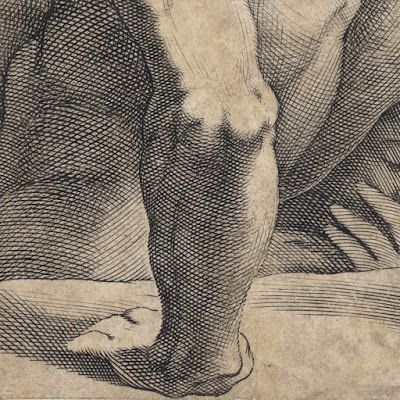 The reason for this narrowing of dates is simply because this print was published by Pietro Stefanoni (c1557–1642) and after 1614 Ciamberlano published his own prints and so it is very likely to have been executed prior to 1614 (Ciamberlano’s dates as an active published are discussed in M Bury’s (2001), “The Print in Italy 1550–1625”, British Museum, London, p. 224). 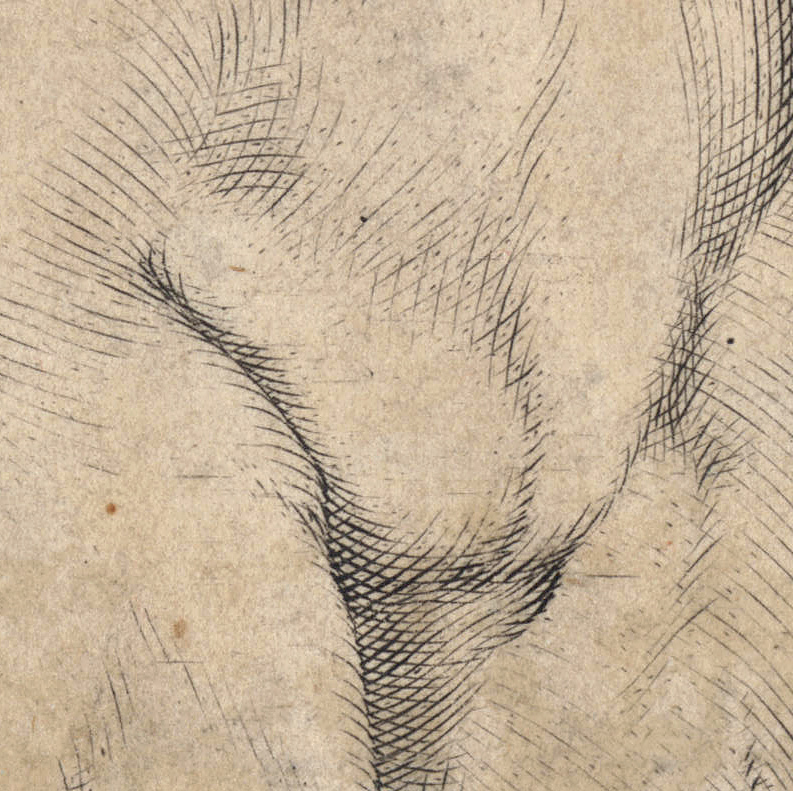 From a personal standpoint I would not be surprised if the engraving were by Ciamberlano as the treatment of the locks of hair and the way that the musculature is revealed seems (to my eyes) to match very closely the stylistic attributes seen in the Ciamberlano engravings that I have posted earlier (http://www.printsandprinciples.com/2017/04/luca-ciamberlanos-engravings-after.html). 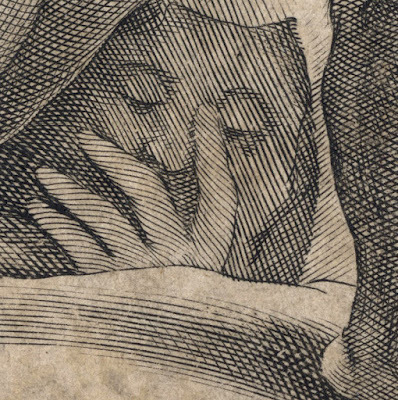 Moreover, if one compares Agostino Carracci approach to rendering forms (see, for example my post about Agostino Carracci’s engraving, “The Mystic Marriage of St Catherine”: http://www.printsandprinciples.com/2017/02/agostino-carraccis-engraving-mystic.html) I do not see the same subtlety of understanding regarding underlying muscles and use of silhouette edges.